The following profile is adapted from excerpts of the Wikipedia article on Fred Astaire. However, all but two of the images have been added by me. Fred Astaire (May 10, 1899 – June 22, 1987), born Frederick Austerlitz, was an American film and Broadway stage dancer, choreographer, singer and actor. His stage and subsequent film career spanned a total of 76 years, during which he made 31 musical films. He is particularly associated with Ginger Rogers, with whom he made ten films. Astaire was born in Omaha, Nebraska, the son of Johanna “Ann” (née Geilus) and Frederic “Fritz” Austerlitz (born September 8, 1868 as Friedrich Emanuel Austerlitz). Astaire’s mother was born in the United States to Lutheran German immigrants from East Prussia and Alsace, while Astaire’s father was born in Linz, Austria, to Jewish parents who had converted to Catholicism. He was the younger brother of Adele Astaire. After arriving in New York City at age 24 on October 26, 1892 and being processed at Ellis Island, Astaire’s father, hoping to find work in his brewing trade, moved to Omaha, Nebraska and landed a job with the Storz Brewing Company. Astaire’s mother dreamed of escaping Omaha by virtue of her children’s talents after Adele early on revealed herself to be an instinctive dancer and singer. 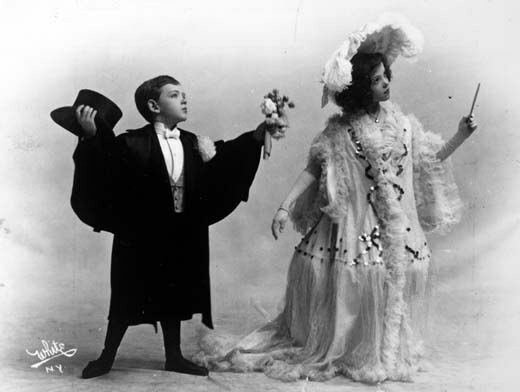 She envisioned a “brother-and-sister act,” which was fairly common to vaudeville at the time. Although Astaire refused dance lessons at first, he easily mimicked his sister’s step, and took up piano, accordion, and clarinet. When their father became suddenly unemployed, the family moved to New York City to launch the show business career of the children. Adele and Astaire had a teasing rivalry but fortunately they quickly acknowledged their individual strengths — his being durability and hers greater overall talent. “Astaire” was a name taken by him and his sister in 1905, when they were taking instruction in dance, speaking, and singing in preparation for developing an act. Family legend attributes it to an uncle surnamed “L’Astaire”. After a short time, as a result of their father’s salesmanship, Fred and Adele landed a major contract and they played the famed Orpheum circuit throughout the United States, including Omaha. Soon Adele grew to at least three inches taller than Fred and the pair began to look incongruous. The family decided to take a two-year break from show business, also to avoid trouble from the Gerry Society and the child labor laws of the time. Their career resumed with mixed fortunes, though with increasing skill and polish, as they began to incorporate tap dancing into their routines. In this, Astaire was inspired by Bill “Bojangles” Robinson and John “Bubbles” Sublett. From vaudeville dancer Aurelio Coccia, they learned the tango, waltz, and other ballroom dances popularized by Vernon and Irene Castle. 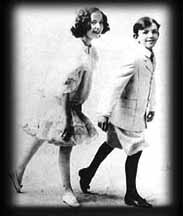 Some sourcesstate that the Astaire siblings appeared in a 1915 film entitled Fanchon, the Cricket, starring Mary Pickford, but the Astaires have consistently denied this. While on the hunt for new music and dance ideas, Fred Astaire first met George Gershwin, who was working as a song plugger in Jerome H. Remick’s, in 1916. Their chance meeting was to have profound consequences for the subsequent careers of both artists. Astaire was always on the lookout for new steps he spotted on the circuit and was starting to demonstrate his ceaseless quest for novelty and perfection. Finally, they broke into Broadway with Over The Top (1917), a patriotic revue. By this time, Astaire’s dancing skill was beginning to outshine his sister’s, though she still set the tone of their act and her sparkle and humor drew much of the attention, due in part to Fred’s careful preparation and strong supporting choreography. After the close of Funny Face, the Astaires went to Hollywood for a screen test (now lost) at Paramount Pictures but were not considered suitable for films. They [ended their professional partnership]* in 1932, when Adele married her first husband, Lord Charles Arthur Francis Cavendish, a son of the Duke of Devonshire. Fred Astaire went on to achieve success on his own on Broadway and in London with Gay Divorce, while considering offers from Hollywood. The end of the partnership was traumatic for Astaire but stimulated him to expand his range. Free of the brother-sister constraints of the former pairing, and with a new partner Claire Luce, he created a romantic partnered dance to Cole Porter’s “Night and Day”, which had been written for Gay Divorce. 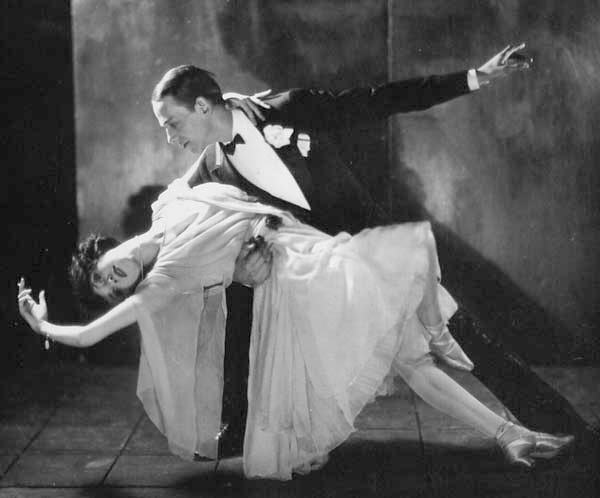 Luce stated that she had to encourage him to take a more romantic approach, “Come on, Fred, I’m not your sister, you know.” This number was credited with the success of the stage play and, when recreated in the film version of the play The Gay Divorcee (1934), ushered in a new era in filmed dance. Recently, film footage taken by Fred Stone, of Astaire performing in Gay Divorce with Luce’s successor Dorothy Stone in New York in 1933 was uncovered by dancer and historian Betsy Baytos, and now represents the earliest extant performance footage of Astaire. On May 9, 1932, after a successful stint with Fred in the revue The Band Wagon (1931) on Broadway, Adele Astaire retired from the stage to marry Lord Charles Arthur Francis Cavendish, the second son of the 9th Duke of Devonshire, and moved to Ireland, where they lived at Lismore Castle. She had three children, a daughter in 1933 and twin sons in 1935, each of whom died soon after birth. By this marriage she was properly styled Lady Charles Cavendish and would have been called Lady Charles in social circumstances. I saw him walking on Lexington Ave in 1954 or 55. As he crossed 51st street outside the shop where I was getting my shoes shined, I was admiring his tie, shirt and jacket until the tasteful outfit glided up onto the sidewalk with such a graceful movement that I looked up at the face beneath the straw hat and shouted Fred Astaire. The guy shining my shoes said, “Aw sure he comes in here all the time!” “Nobody walks like Fred Astaire” I told my schoolmates at Parsons School of Design where I was studying Graphic Design and fashion illustration. I still love and live in New York 59 years later.